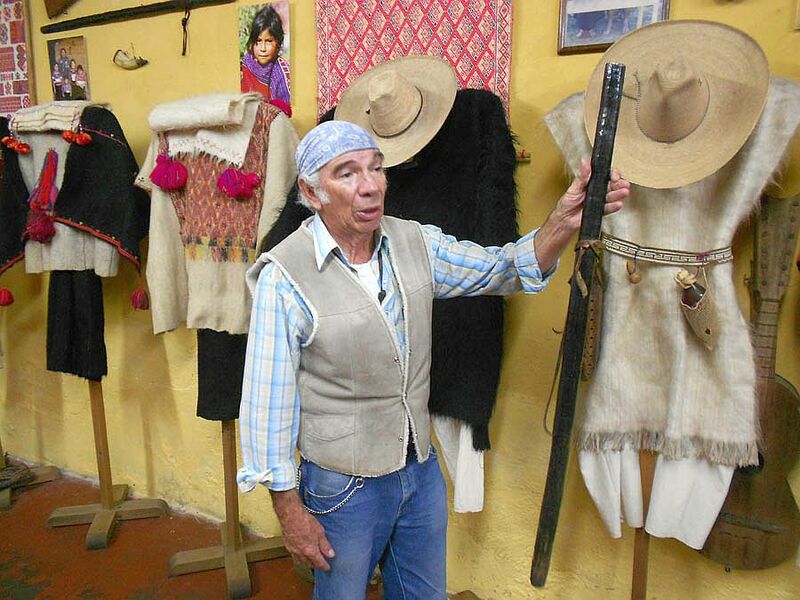 What a full-on “gut check” it was to arrive at the “Museo de Trajes Regionales” at 5:00pm on a rainy night, expecting to tour a museum of indigenous clothing…which eventually happened. But not without a reality check first of how the 45 year old costume collection came to be…. 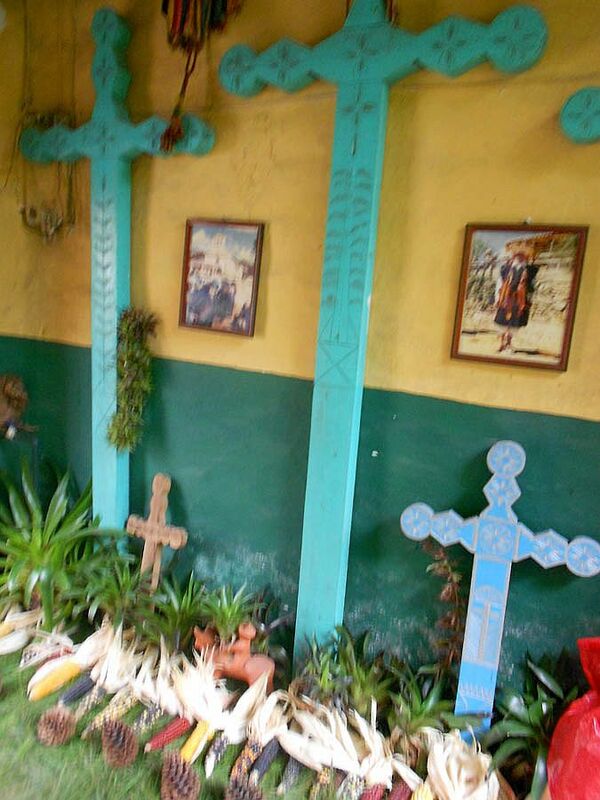 The first thing I noticed upon entry was the traditional Mayan offering in the front doorway; the three turquoise crosses, surrounded by indigenous plants and dried ears of corn arranged on the floor. Across the courtyard, I could see a line of people — mostly women and babies, quietly waiting their turn to see Sergio Castro, whom up until this point, I thought was just the “curator” of the museum. Instead what I witnessed was a small brown man, sitting on an even smaller wooden stool, wearing a bandana and a pair of cowboy boots, quietly and meticulously weaving both burn dressings and hopes of miracles at the same time. I could not enter. It just seemed too personal. 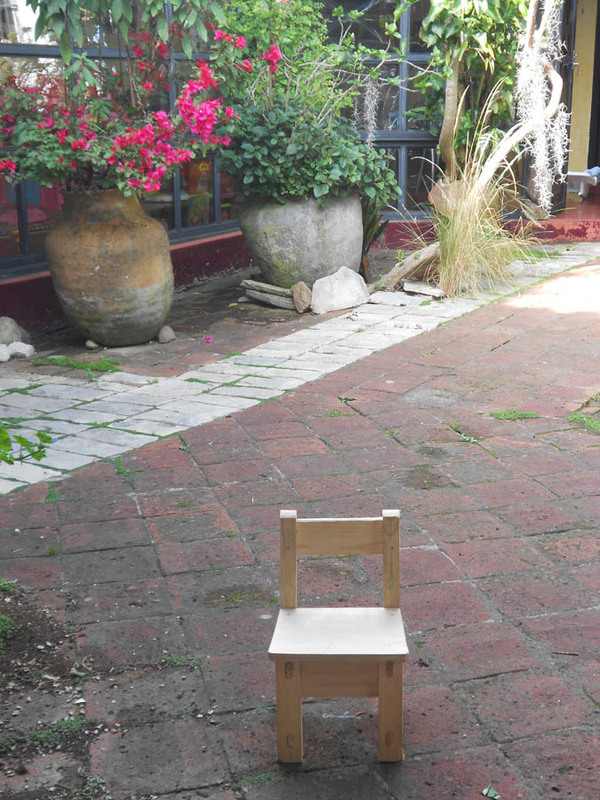 So I waited in the entry way and watched as Sergio treated them, one by one, in the small courtyard using the most rudimentary of medical supplies; gauze, small surgical scissors, and Vaseline, much of it supplied by volunteers. One of these volunteers was Pati, a physician’s assistant from Tucson, who maintains a blog about her multiple volunteer trips to assist Don Sergio. If there was ever a way to make me feel grateful and humble to the point of tears, this was it. Seeing the “clinic” through Pati’s eyes, hearing her talk about examining wounds and instantly knowing what was required for optimum healing, yet turning to the small table and realizing the necessary supplies just weren’t there, so she reaches instead for the jar of Vaseline…this was “museum enough.” I did not need to see the clothing. 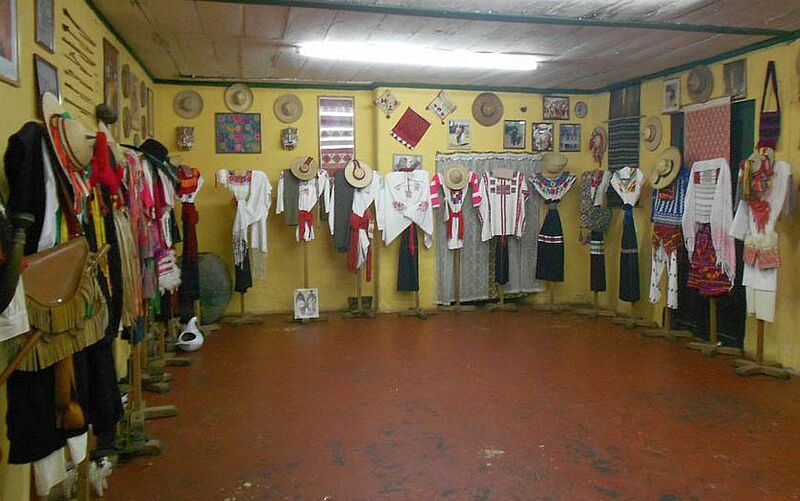 What was so moving to me was the realization that the costumes lining the walls in the adjacent room were gifts that Don Sergio had received from indigenous tribespeople as a “thank you” for his humanitarian efforts to provide treatment to the villagers. These gifts were made more special and rare by the fact that tribal clothing typically accompanies the individual to the grave at time of death. What started out as a career in agriculture as a trained veterinarian, working to develop access to clean water, evolved into the role of a healer, treating the indigenous Mayan communities of Chiapas. He serves the indigent, the burn victims, and diabetes amputees who do not have heat or running water; they insulate their homes with cardboard, and do not have money for food outside of what they have grown themselves, let alone health care. And in his spare time, he has built 35 schools and water catchments systems. Oh yeah. And he is curator of a museum. Within no time, the line of patients waiting on the small wooden benches was gone, and Sergio summoned us into the room of costumes. I wanted to say, “No, you have more important things to do!” but I became instantly captivated as he began speaking in native dialect, first in Tzotsil, then Tzeltal and then Lacandon Mayan; all this from a native Spanish speaker, giving a tour in English, but who also speaks French! 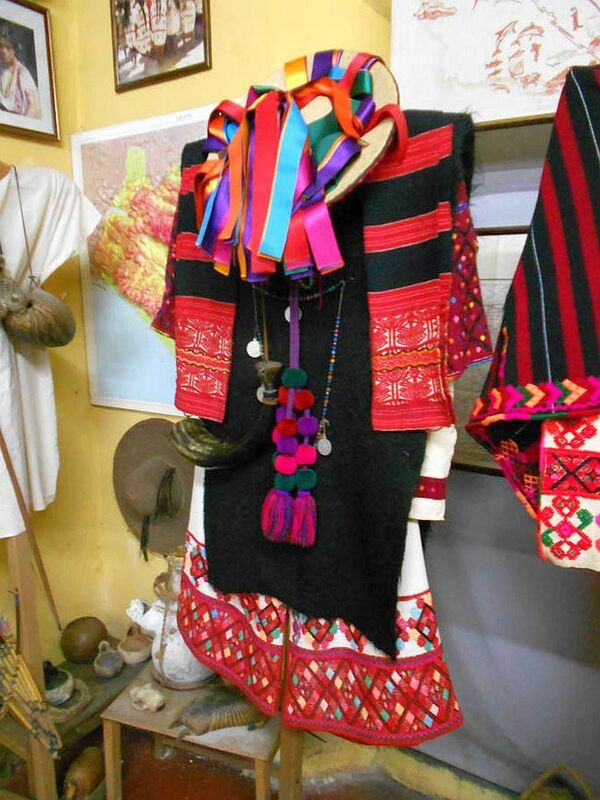 He went around the room explaining the details of each of the tribal costumes, paired for man and woman, many of hand woven fabric, pointing out the fine details of each costume with the same pride as if he had woven them himself. I knew this museum was “donation only.” I already had my donation rolled up in my pants pocket before I arrived. However, after what I witnessed in the courtyard, I doubled it. And then I came home and gave some more. If you are so inclined, it is difficult to imagine a better cause….seriously. Donate! 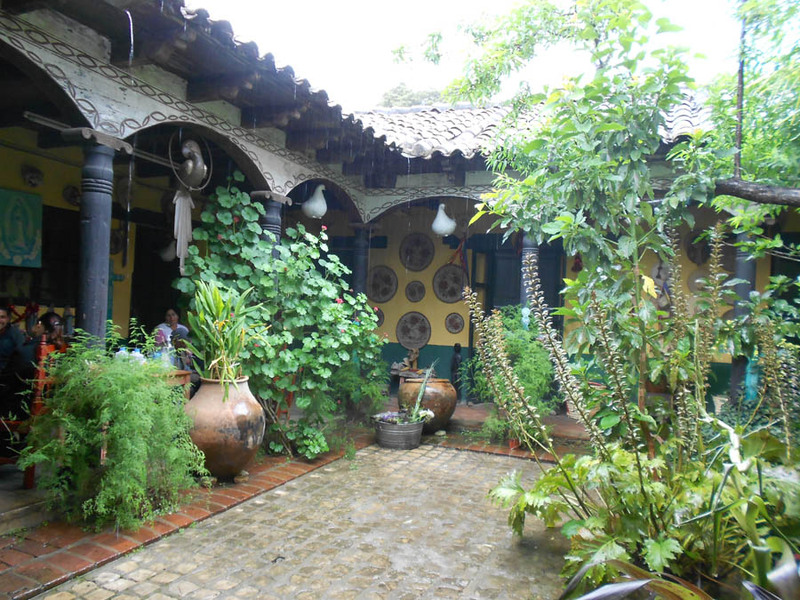 This entry was posted in Mexico, San Cristobal de las Casas, San Juan Chamula and tagged Museo de Trajes Regionales, Sergio Castro, Yok Chij by Suzanne. Bookmark the permalink.